From a media outlet that pays citizens to report from remote areas of Kenya to a portal that uses humor as its main strategy to inform Russians, journalism faces different challenges in different cultural and social contexts. Creativity, however, seems to be a common skill that media entrepreneurs shared in addressing their problems at the International Symposium on Online Journalism (ISOJ) on Saturday, April 16. Chaired by Maria Teresa Ronderos, director of the Independent Journalism Program at the Open Society Foundations, the panel “Global roundup: Creative solutions for online journalism challenges around the world” focused on six online journalism initiatives ongoing in different regions the globe. Different from Belarus, Kenya does not restrain freedom of speech, and it is from that reality that Enock Nyariki presented his experience as editor of HiviSasa.com, a Kenyan online platform that pays citizens for reporting. “Every day can be the last day. But we try not to think about that.” — Galina Timchenko, Meduza (Russia). Launched in 2014 with a focus on local news, HiviSasa offers basic journalistic training for future writers. Nyariki admitted his operation is unable to check the veracity of all the stories, but they do pull a story if it has been deemed inaccurate. However, according to Nyariki, the number of fake stories is very low. Another context presented at the panel came from Kelly G. Niknejad, editor-in-chief of the independent news organization Tehran Bureau, relating her experience on reporting about Iran from a virtual bureau based in Boston. “Non-Iranians do not have access to Iran. And, when they do, the access is very superficial,” she said. The digital revolution, Niknejad said, permitted the Bureau to cover Iran from afar, using sources from within the country, and this is a good strategy to deal with state censorship. From El Salvador, Carlos Salamanca brought his experience as the business and administration manager of El Faro, an investigative journalism initiative that manages to survive financially thanks to its readers’ help. Reporting from Sudan, foreign correspondent Trevor Snapp showed how he and his team at Nuba Reports are trying to overcome the difficulties of reporting in war zones by investing in video reporting and making partnerships. Snapp also told the ISOJ audience that Nuba Reports travels to remote communities in Sudan to offer what they call “mobile cinemas” as a way to keep citizens informed. The last experience concerned Russia. Galina Timchenko runs Meduza, a news portal based in Latvia that uses humor (like games and quizzes) and explanatory journalism to overcome the lack of access to quality news in Russia. “There is a lot of social apathy in Russia. Nobody wants to take part, nobody wants to put emotion on this news topics,” Timchenko said. “And we do special games based in real news.” One of the games (an app) plays on President Vladimir Putin’s habit of arriving late for appointments. Asked about how Meduza manages to survive in a state-controlled media environment, Timchenko basically shrugged her shoulders. The 17th ISOJ was held April 15-16 at the Blanton Museum of Art on the campus of the University of Texas at Austin. Video from both days can be found here in English, and here in Spanish. 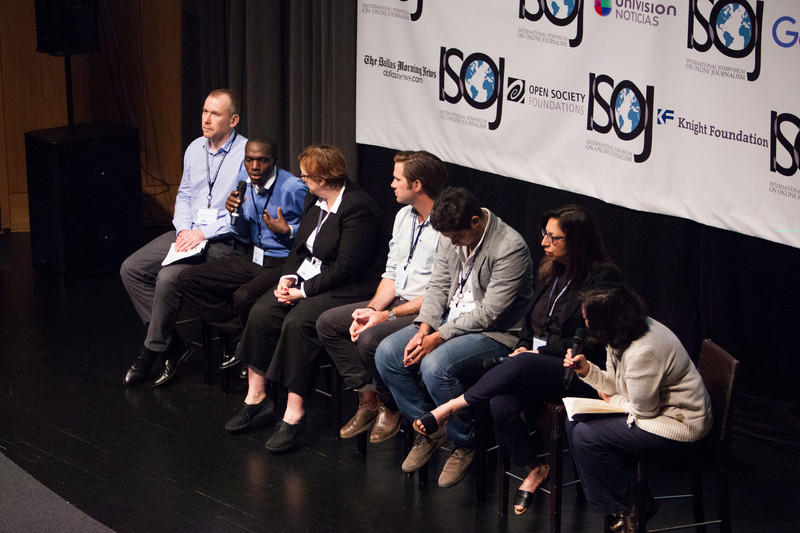 The 18th annual ISOJ is scheduled for April 21-22, 2017, in Austin, Texas. This story originally appeared on the website of the Knight Center for Journalism in the Americas and is reprinted with permission. Note: The Open Society Foundation is a donor to GIJN. Giovana Sanchez is a graduate research assistant at the Knight Center for Journalism in the Americas at the University of Austin. Previously, she worked as a reporter for Brazil’s Globo news website. She graduated in journalism from the Federal University of Santa Catarina (UFSC) in Brazil. The Bell illustrates a growing trend in which Russian journalists and media managers are finding ways of building news organizations that are not financially dependent on rich businessmen vulnerable to Kremlin pressure.